GPS is a topic that I have not touched because I still haven’t got one. A good GPS unit can be quite expensive and I am still waiting when I have saved enough money for it. GPS is very impressive but scary at the same time because the satellites can actually track where I am. Think about it, if the US military uses GPS to hit their target, it is surely very accurate. I do have some experience with GPS because I borrowed from my friend a few times and managed to know how to find a location, updating the unit software and also looking for the latest maps. The menu on the GPS unit is pretty straight forward and easy to understand but the technical part such as putting more than one gmapsupp.img file on the GPS unit or even using the JetMouse keygenerator can be pretty tough and confusing to a novice user. Anyway, since I do not have a GPS unit, I am sure I can somehow view the maps in my computer without the GPS tracking capability. I found out that MapSource, a software provided by Garmin is able to create, view and edit waypoints, routes and tracks as well as to find items, addresses and POIs. Previous MapSource not found! Setup will terminate. It seems like the file that I downloaded is an update and not the full installation setup. 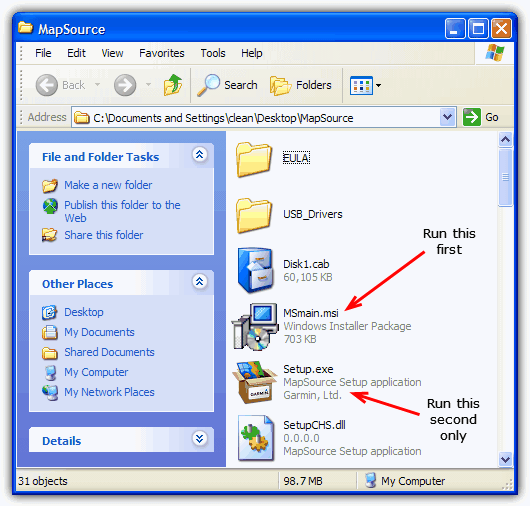 Luckily there is a trick on how to install MapSource without having the original installation CD. 1. Download the latest MapSource from Garmin. 2. When finished downloading, if you use archiving software such as 7-Zip, WinRAR or PowerArchiver, you can right click on the file that you downloaded and extract. If you’re unsure, you can use Universal Extractor to extract the MapSource installation file. The extracted files can also be found in the Windows Temp folder if you know how to get there because some folders in the Temp path are hidden. Run the installer and when you see the Welcome screen go to the Temp folder. Look for a folder with 7zxxx.tmp (the x’s are random characters) for a name which contains a file called MSmain.msi inside with several other files. Copy that whole folder to your chosen location. 3. 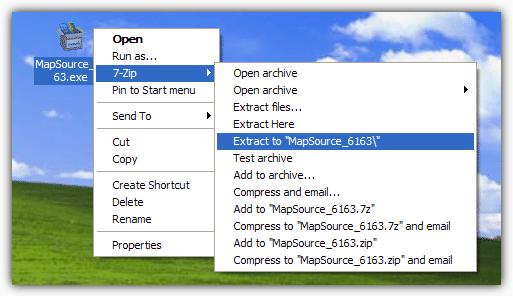 Open the extracted MapSource folder . You should see a number of files and folders. Now run MSmain.msi first, wait for it to complete (there will be no windows to click on) and then run Setup.exe. Follow the instructions to complete the installation. If you do not have any maps installed for MapSource, you might see an error window that says “MapSource could not find any installed MapSource map products. Please install one or more MapSource map products and start MapSource again”. There are some maps for MapSource that cost money and some free. If you want to take a look how MapSource works, here’s a free Australia map. Just download, install and then run MapSource. The Australia map will be automatically loaded in MapSource. I have found a site with free maps to cover a large proportion of the world, just make sure to read the FAQ on how to install and select the map in MapSource. The website is OpenStreetMap and all you do is select your area in the dropdown boxes, click the link to go to the download page. Then download the Windows file and install it. I’ve tried a few and they seem to work. Congratulations on this post content. Funciona !! Muchas Gracias !!! Worked great. Installed fine on my new Dell XPS13 9260 (Windows 10). I still use Mapsource. Simpler and faster than Basecamp. Thanks for taking the time to document this procedure. A big thank you! I had my dvd but my ultrabook had no dvd tray so this work around was perfect. Very nice. Big Thank YOU! Actually I used WinRAR as an extractor. As I never could find the new folder that had the extracted files in it by looking in Windows Temp folder. Perhaps 7-zip created it in my download folder and I just did not see it. But I found a folder named MapSource_6163 in the download folder when I finally used WinRAR. Most likely 7-zip worked I did not see the new folder. Unless I’m mistaken, there’s an even easier method. Change the extension of any file to .exe and Mapsource should install with no troubles. Just tried it again myself, working fine…. Thanks man! you r the one! Tus datos fueron de mucha ayuda. El mundo seria diferente si la gente fuera menos egoista y compartira como lo has hecho vos. Great – thanks for the very useful tip. How come Garmin make things so hard ….? It is a great tip, I had tried with this download before but it was necesary to follow your steps… THKS. You can get free maps from Central America in cenrut.org. Is there also a free map of Europe or the Neterlands? can i get myanmar map ? Your fantastic dude! great blog! I was stuck with “previous mapsource not found, setup will terminate!” one! oh my god… thank you man ..
A more simple way to install: create the Garmin folder in the Program Files and copy whatever file you want into it. Then rename that file to MapSource.exe. Presto! Thank you so much for the tip! I lost my disc so this was really helpfull. It works great! Thanks a lot! I managed to install latest MapSource and Australia Map loaded to 255W for my Melbourne trip tomorrow. any one got a map for southafrica or africa?? Hi here is my expirience with the usage of Maps from different Regions. I own a StreetPilot® c510 preloaded for Europe. I updated this device with Germany + BENELUX (internal Storage) and Europe excluding Germany + BENELUX (opional SD-Card). This configuration is proper working in Europe including address entering, FAVORITES and POIs. For my trip to Canada last year I licensed a North America Map and loaded this Map to a second SD-Card. I replaced the EUROPE SD-Card by the NA SD-Card and loaded some Canadian POIs to the Device. Now in EUROPE I could enter canadian Adresses and could use the FAVORITES Menue to show the Map in the Device. I could not access canadian POIs. Arrived in CANADA I could enter canadian Adresses and could use the FAVORITES Menue to show the Map in the Device. I could also access canadian POIs. Only the EUROPEAN POIs was now not available. Als ik bij 1 op downloaden klik wordt het bestand MapSourceUnitedStatesTOPOBasemapPatch.exe binnen gehaald. Dit kan ik niet uitpakken en op het bestand main.msi uitvoeren. Als ik het bestand installeer dan krijg ik de melding: Previous MapSource-US Topo installation not found! Ook heb ik Tracks4Australia (1.20).exe geinstalleerd. Sorry, at the prior comment I wrote in portuguese. So maybe you can help me. I try to install a new version of mapsource 6.15; and always shows an error message: “error on family 200 reinstall”. Fui atualizar o mapsource, fiz o download na garmin, mas na isntalação da erro dizendo, reinstalar family 200. All the above instruction are working. I load the above australia map into the mapsource and it is woring. However when I transfer it to SD card and put it inside my garmin 205, it does not work. Can you assist? Raymond. Thanks . The message and instruction on how to obtain and operate the mapsource was very clear. 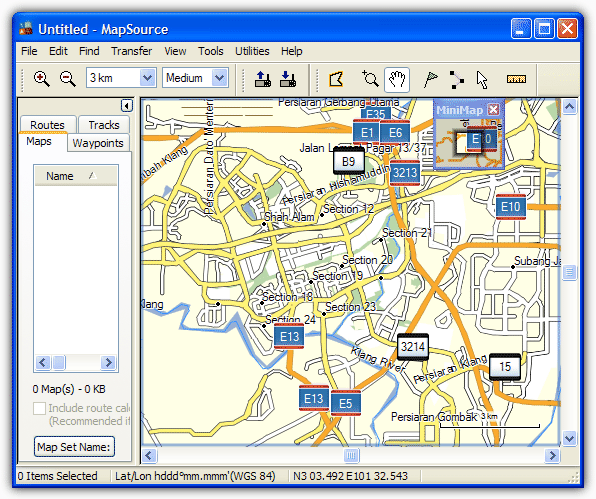 thank’s buat tips penginstallan mapsource, ok banget !!! Please help me to get my country map(Myanmar, Burma)for free. Tenia varios dias tratando de instalar esta aplicacion. any one know if there is free map for Philippines?pls let me know. I tried it with MapSource 6.15.6 as well as the older version 6.13.6. HERE Venezuelan and some Caribbean’s island map from our GPS forum in Venezuela. Thank you, it’s work fine!!! looking at the picture you attached. I see that you have a lot of european maps. I just need the french one. My garmin nuvi 265T is already pre-loaded with North america. Do you think I can add just the french map? Do you know how I can hold of a french map? It’s a spanish writen site but it has an english basic instalation tutorial. You only have to become a member and then you can start to download maps. You will have to activate your account (from your mailbox) within 24 hours from receipt confirmation message. I don’t have a dedicated GPS machine either. But… recently – through eBay- I picked up a several year old Itronix 260+ rugged lappy. Good price and it has a GPS receiver built in. I’ve found a good deal of open source s/w for it as well, but I haven’t spent much time with it yet. Is there a free Malaysia Map available? yes R, yes Gali , and the gouvernement doesen’ listen to your phones cause is immoral. Gali is a 100% correct. They do not return data so storing your positions is impossible. Thanks for the useful info … as usual ! ^^ Yep Gali is correct, Satellites have NO way of seeing where you are with a conventional GPS device, they only receive the satellite signals and do not transmit anything back to the satellites themselves. Raymond, that not true at all. GPS is passive possitioning system. Bassicaly, GPS sattelites sends specific signals and according them GPS client identify location over the Earth. Its one way signal like classical sattelite TV. So sattelites know anything about your position.